Today Match Prediction of Paarl Rocks vs Jozi Stars, 5th T20 Preview, Playing 11, Injury Updates, News and Dream11 Prediction. Chris Gayle, Cameron Delport and Dwayne Bravo will not play. Both the teams will play their 2nd match and will look for a maiden win. If you are looking for JOZ vs PR Dream11 Prediction then you are are the right place. Paarl Rocks are all set to take on Jozi Stars on Tuesday, November 20, 2018, at Boland Park, Paarl. Do you want to know Who Will Win? Then you are in the right place. In Today’s Dream11 Fantasy Cricket Match of JOZ vs PR, we will cover Pitch Report of Boland Park, Paarl, Predicted Playing 11, Toss Prediction, and Fantasy Cricket News and Tips. You May like to Read AUS vs IND Dream11 Prediction. Who Will Win the Match Between JOZ vs PR and Toss Prediction? 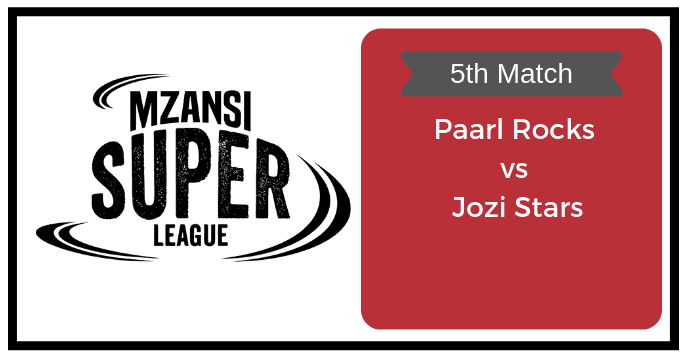 Paarl Rocks and Jozi Stars, both the teams have started their campaign on a losing side and will play their second match. They will aim for the maiden win but unfortunately, only one team will taste the victory. Paarl Rocks (PR) have almost won the last match but the opposition took the match in the last over. Cameron Delport played an outstanding knock but he also failed to take their team on the happier side. Dwayne Bravo took 3 wickets in the first match. Paarl Rocks will have to think twice today as their key players will not play today. Read the complete news below. Jozi Stars (JS)have started well with the bat but they couldn’t convert that into a big total so as a result, they could only post a small total and the opposition chased it quite convincingly. Chris Gayle was good with the bat but he has left Abu Dhabi for T10 and this may a sign of worry for Jozi Stars team management. Dane Vilas was good with the bat he also could not covert it into a big score. Apart from the skipper Rassie van der Dussen also showed how dangerous he could be on any given day. Beuran Hendricks and Eddie Leie tried their best with the bowl but failed the defend the low score. Fantasy Cricket Expert Tips: The Proteas International players have landed in South Africa on Monday but they will not play as they will most likely rest for at least 48 Hours. Take this into account before making your teams. Michael Klinger, Henry Davids, Vaughn van Jaarsveld, Dane Paterson and David Wiese are the key players of Paarl Rocks Team. In the absence of Faf du Plessis, Henry Davids will lead the PR Team. Cameron Delport and Dwayne Bravo left Abu Dhabi for T10 matches so they will not play. Faf du Plessis Tabraiz Shamsi and Aiden Markram will also not play as they will take rest for at least 48 Hours and may be seen in the next match. David Wiese may replace Dwayne Bravo and Tshepo Moreki or Eathan Bosch will replace Cameron Delport. Michael Klinger, Henry Davids and Vaughn van Jaarsveld will lead the batting department. Dane Paterson, Bjorn Fortuin and Kerwin Mungroo will lead the bowling department. Batsmen: Michael Klinger, Vaughn van Jaarsveld, Patrick Kruger, Henry Davids. All-Rounder: Grant Thomson, David Wiese, Eathan Bosch. Faf du Plessis (c), Dwayne Bravo, Vaughn van Jaarsveld, Mangaliso Mosehle (wk), Dane Paterson, Cameron Delport, Henry Davids, Michael Klinger, Grant Thomson, Patrick Kruger, Eathan Bosch, Kerwin Mungroo, David Wiese, Aiden Markram, Bjorn Fortuin, Tshepo Moreki, Tabraiz Shamsi. Rassie van der Dussen, Dane Vilas, Daniel Christian, Beuran Hendricks and Eddie Leie are the key players of Jozi Stars. Dane Vilas will lead the JOZ Team. Chris Gayle has left to Abu Dhabi. He will not play. Reeza Hendricks, Dwaine Pretorius and Kagiso Rabada are still not available for today’s match. Sinethemba Qeshile will replace Gayle. Ryan Rickelton, Rassie van der Dussen and Dane Vilas will lead the batting department. Beuran Hendricks, Duanne Olivier and Eddie Leie will lead the bowling department. All-Rounders: Daniel Christian, Simon Harmer/Nono Pongolo. Bowlers: Beuran Hendricks, Duanne Olivier, Eddie Leie, Calvin Savage. Dane Vilas (c & wk), Dwaine Pretorius, Beuran Hendricks, Reeza Hendricks, Petrus van Biljon, Duanne Olivier, Nono Pongolo, Shimane Alfred Mothoa, Ryan Rickelton, Sinethemba Qeshile, Chris Gayle, Daniel Christian, Calvin Savage, Kagiso Rabada, Eddie Leie, Simon Harmer, Rassie van der Dussen. Both the teams have lost their first match and will bounce back with more preparation and more homework. Some of the important players will not feature in today match this may be a sign of worry for both the teams. According to crix11 astrology prediction, PR will win the match today. JOZ will win the toss and ask PR to bat first. The match will be played on the 20th November of 2018 (Tuesday). Match Mzansi Super League 2018, PR vs JS, 5th Match. Boland Park pitch is a batting paradise and the batsmen will be benefited from the pitch. The ball will come nicely on to the bat and the batsmen can easily play on the rise shots. The bowlers will have to put extra effort to take advantage of the wicket. The fast bowlers may get some help from the wicket in the initial couple of overs because of the weather condition. Fantasy Cricket Expert Tips: The weather condition will favour the fast bowlers in the initial couple of overs. Consider this information into the account before making Dream11 Teams. This is it for Today’s JOZ vs PR Dream11 Team Prediction of 5th T20 of Mzansi Super League 2018. Read the complete post and win in any fantasy cricket league. Leave a comment below and share the post so that others can also find Crix11 which is the best fantasy cricket prediction site. Don’t forget all the information on this website is absolutely free and if you utilize the data correctly your winning chances is 100% sure.